Of a middle-class family from the West Riding of Yorkshire, Barbara Hepworth was born in Wakefield on 10 January 1903; her father, Herbert Hepworth, would become County Surveyor and an Alderman. She trained in sculpture at Leeds School of Art (1920-1) and, on a county scholarship, at the Royal College of Art (1921-4), meeting the painters Raymond Coxon and Edna Ginesi and the sculptor Henry Moore. Hepworth was runner-up to John Skeaping for the 1924 Prix de Rome, but travelled to Florence on a West Riding Travel Scholarship. 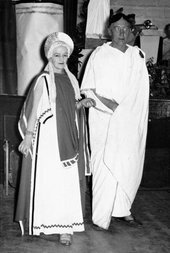 After visiting Rome and Siena with Skeaping, they were married in Florence on 13 May 1925 and moved to Rome, where both began carving stone. In November 1926, they returned to London. Links forged through the British School at Rome with the sculptor Richard Bedford (a curator at the Victoria and Albert Museum), ensured that the collector George Eumorfopoulos visited their studio show in 1927 and bought two Hepworths. The couple moved to 7 The Mall Studios in Hampstead in 1928 (where Hepworth remained until 1939). With Bedford and Moore, they became leading figures in the 'new movement' associated with direct carving. Successful joint exhibitions in 1928 (Beaux Arts Gallery, London and Alex. Reid and Lefevre, Glasgow) and 1930 (Tooth's) consisted of animal and figure sculptures in stone and wood. They joined the London Group and the 7 & 5 Society in 1930-1. A son, Paul, was born in August 1929, but the marriage was deteriorating and in 1931 Hepworth met Ben Nicholson (then married to Winifred Nicholson), who joined her on holiday at Happisburgh, Norfolk. She and Skeaping were amicably divorced in 1933. In 1934 Hepworth gave birth to triplets; she married Nicholson four years later. 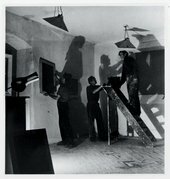 Hepworth and Nicholson revealed their move towards abstraction in joint exhibitions in 1932 (Tooth's) and 1933 (Lefevre). 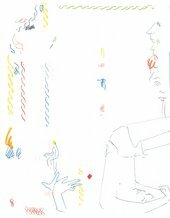 This became the abiding direction of her work, epitomised by the pioneering piercing of the block, and coincided with experiments in collage, photograms and prints. Establishing links with the continental avant garde, the couple visited the Parisian studios of Arp, Brancusi, Mondrian, Braque and Picasso. They joined Abstraction-Création, and were major figures in Paul Nash's Unit One grouping and the associated publication edited by Herbert Read (1934). In 1935 they were instrumental in restricting the 7&5 to abstract work, thus paving the way for a fertile period of constructivism enhanced by artist refugees from totalitarian Europe (Gropius, Moholy-Nagy, Breuer, Gabo). This culminated in the publication of Circle: International Survey of Constructive Art (1937), edited by Nicholson, Gabo and the architect Leslie Martin, and designed by Hepworth and Sadie Martin. Such utopianism was curtailed by the war, and Hepworth and Nicholson evacuated to St Ives, Cornwall. They stayed with Margaret Mellis and Adrian Stokes at Little Park Owles, Carbis Bay. 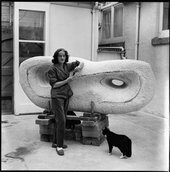 Domestic demands and lack of space restricted Hepworth to small sculpture and painting until, on moving to Chy-an-Kerris, Carbis Bay in 1942, she secured a studio. Her first major solo exhibition (Temple Newsam, Leeds 1943) was followed by a monograph by William Gibson (Barbara Hepworth: Sculptress, 1946). She was prominent amongst St Ives artists, forming a focus in 1949 for the establishment of the Penwith Society of Artists with Nicholson, Peter Lanyon and others, and helping to attract international attention to the group's exhibitions. 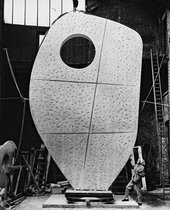 Although Hepworth's contribution to the 1950 Venice Biennale was dogged by comparisons with Moore, two retrospectives - in Wakefield (1951) and London (Whitechapel 1954) - and Read's monograph (1952) confirmed her post-war reputation. She bought Trewyn Studio, St Ives in 1949, where she lived after her divorce from Nicholson two years later. She visited Greece in 1954 in an effort to recover from the sudden death of Paul Skeaping (1953). Hepworth was especially active within, and on behalf of, the modernist artistic community in St Ives during its period of post-war international prominence. Her experience of the Cornish landscape was acknowledged in her choice of titles. In a wider context, Hepworth also represented a link with pre-war ideals in a climate of social and physical reconstruction; this was exemplified by her two sculptures for the South Bank site of the Festival of Britain (1951). Public commissions and greater demand encouraged her to employ assistants for preliminary work - including Denis Mitchell and Dicon Nance - and to produce bronze editions. Hepworth's international standing was confirmed by the Grand Prix of the 1959 São Paolo Bienal, which came amid honorary degrees, the CBE (1958) and the DBE (1965), and a second Whitechapel exhibition (1962) and a European tour (1964). In 1964, Single Form was erected outside the United Nations building, New York as a memorial to the Secretary-General, Dag Hammarskjöld. 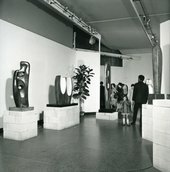 Hepworth served as a Tate trustee (1965-72), donating six works in 1964 and a further nine in 1967 prior to the 1968 retrospective at the Gallery. The catalogue raisonné by Alan Bowness (the sculptor's son-in-law) included in J.P. Hodin's 1961 monograph was extended in 1971. With her long-standing friend the potter Bernard Leach, she was awarded the Freedom of St Ives in 1968 as an acknowledgement of her importance to the town. After a long battle with cancer, she died there on 20 May 1975 in a horrific fire at her home. The studio was designated the Barbara Hepworth Museum in the following year and, on coming under the Tate's aegis in 1980, secured an unrivalled collection of her work for the Gallery. Since then, scholarly interest has focused on her status as one of the few women artists to achieve international prominence. Dame Jocelyn Barbara Hepworth (10 January 1903 – 20 May 1975) was an English artist and sculptor. Her work exemplifies Modernism and in particular modern sculpture. She was one of the few female artists of her generation to achieve international prominence. Along with artists such as Ben Nicholson and Naum Gabo, Hepworth was a leading figure in the colony of artists who resided in St Ives during the Second World War.